In response to China’s latest announcement on their one-child policy and the incident of a Taiwanese woman giving birth on a China Airlines flight to the U.S., Taiwan’s National Education Radio recently invited me to talk about America’s “anchor baby” controversy on their morning talk show. An “anchor baby” is a child that born to a noncitizen mother in a country which has birthright citizenship. The term is especially offensive when viewed as providing an advantage to family members seeking to secure citizenship or legal residency. Offensive or not, anchor babies do exist. According to the Department of State, noncitizen mothers gave birth to 35,000 babies in the U.S. last year, and 30,000 of them were born to Chinese women who traveled to the U.S. for the sole purpose of giving birth (Chinese language link). And this, of course, has a lot to do with China’s one-child policy. For several decades, the only way for a Chinese couple to have a second child, is to give birth outside of China in a country which has birthright citizenship. Taiwanese, though not under the one-child policy, like to have their babies born in the U.S. for a “potentially better future” for the children. It is reported that last year about 300 Taiwanese woman traveled to the U.S. just to have their babies born here. Now, a recently announced rule allowing couples to have two children will be officially adopted on the first day of next year in China, and some Chinese couples have canceled their plan of giving birth in the U.S.
For example, a girlfriend of mine from Nanjing is pregnant with her second child, due next May. 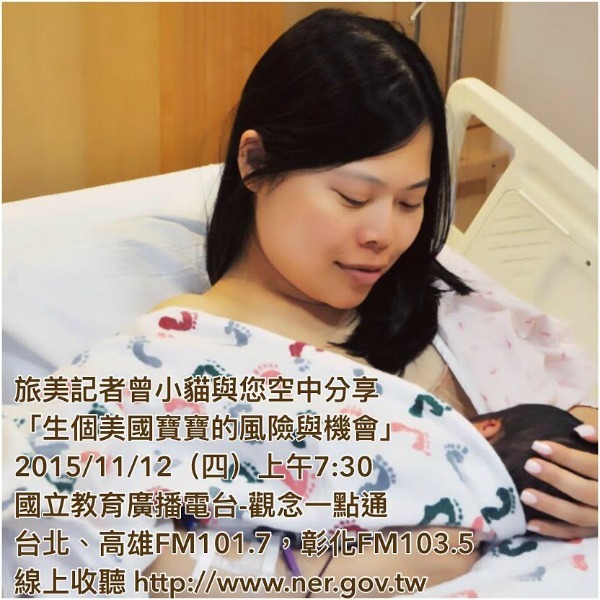 She was planning to come to the U.S. to give birth here, but she changed her birth plan after the China’s National Health and Family-Planning Association made the announcement that it was ending the one-child policy, which was instituted in the late 1970s. She told me that many mothers from her QQ (Chinese Facebook) group “Giving Birth in America” also changed their mind about giving birth in the U.S., since the announcement. This is good news. In fact, it is very risky for these Chinese women to travel to the U.S. and give birth here. The high demand of giving birth to an American baby among Chinese mothers has led to the illegal operation of “maternity tourism” in California, New York, and other areas where Chinese-Americans have settled. The maternity tourism service providers arrange for the Chinese mothers to enter the U.S. on tourist visas and hide them in apartment homes, or so called “maternity centers,” while waiting to give birth. This practice is often associated with visa fraud, conspiracy, and other crimes in which women were helped to fabricate documents for visa applications and coached to falsely claim that they were traveling to the U.S. for tourism. I followed the maternity tourism story for years as a journalist. The stories that occur in the “maternity centers” can be scary. Some of the “maternity centers” are very popular, so popular that the service providers want all the mothers to give birth and leave as soon as possible. This is so they can arrange more maternity trips for more mothers. The centers often give drugs that induce labor to the mothers, and the drugs can be harmful to the babies. Earlier this year when the Federal government raided maternity tourism in California, hundreds of mothers with little big bumps or tiny babies were throw into the street. It was horrible. Many mothers knowingly came to the U.S. in full awareness of the risks. It’s hard to understand why they would be willing to risk their health and the the babies’ well-being. Let’s wish the trend will slowly die down with the end of China’s one-child policy. This is an original post to World Mom Blog by World Mom, To-wen Tseng of California, USA . « VIDEO & PHOTOS: World Moms Blog at the 2015 @UNCANews Awards! But is’nt it risky for mother and baby to travel during third trimester? Of course the mothers do know the risk and are (or now we should say ‘were’) willing to take for the secure future of baby. I myself traveled to my homeland India in third trimester but I knew I was going my home so any risk was possible to handle. The citizenship based on birthplace in USA should have stricter clauses to avoid this case. Yes, it’s risky for mother with baby to travel during the third trimester. It’s hard for us to understand why these mothers would willing to risk their health simply for U.S. citizenship. In fact all the airlines have some kind of policy to restrict women pregnant for 30 weeks or more to fly, but there are plenty of “guides” in Chinese across Internet to teach the mothers how to hide their pregnancy. It’s sad. To-wen — thank you for explaining the anchor baby issue to us — I learned so much from your post!